Alisala Nunes, a first-year student, initially wanted to attend a liberal arts school. But when she discovered she could pursue a degree in civil engineering at San Jose State University’s top-ranked Charles W. Davidson College of Engineering and apply for the Humanities Honors program, it seemed like a win-win. “It was a nice surprise that SJSU had a program like this,” she said. The Humanities Honors program was founded in 1954 by four professors who combined history, literature, arts and philosophy education into a four-semester program that fulfills many GE requirements while also providing a learning community for students. The students stay together as a cohort for four semesters. For Nunes, she said the Humanities Honors Program has already begun to teach her the analytic and communication skills she will need for engineering, where she sees the ability to work as team member to be essential. Through the program, students attend a lecture class that is team taught by four professors and then break out into smaller groups for seminar sessions. Carmel Weiler, a graduate student in philosophy and Rostankowski’s teaching assistant, said she joined the program as an undergraduate. Even though she had to stop out for personal reasons, she said being part of the program helped her resolve to return to her education years later. During her time away from her studies, she kept all her books; they benefited her as she tutored neighborhood kids. “The program stressed how to write well, and that will help me in the research phase,” she said, as she continues to work on her master’s and plans to pursue a doctorate. 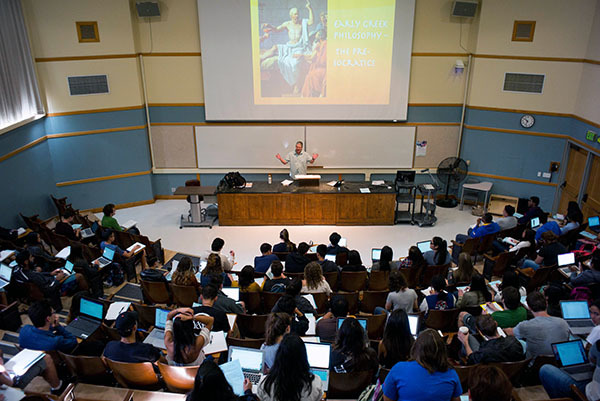 In 2014, the department began offering an Advanced Honors Program that works on the same principles, completing SJSU Studies areas R, S and V. It is a two-semester program that is team-taught and provides a cohort for upper division students who have successfully completed the WST, including incoming transfer students. As a business major with an emphasis in marketing, he said he made many friends in Advanced Honors and has learned a lot about writing. The skills have already helped him as he pens cover letters for his job search. In addition to the skills and knowledge students gain in the classroom, Rostankowski said the programs also provide mentoring and advising for students.